Design and implement a remediation program to reduce a diverse array of contaminants in soil and groundwater during site-wide redevelopment. 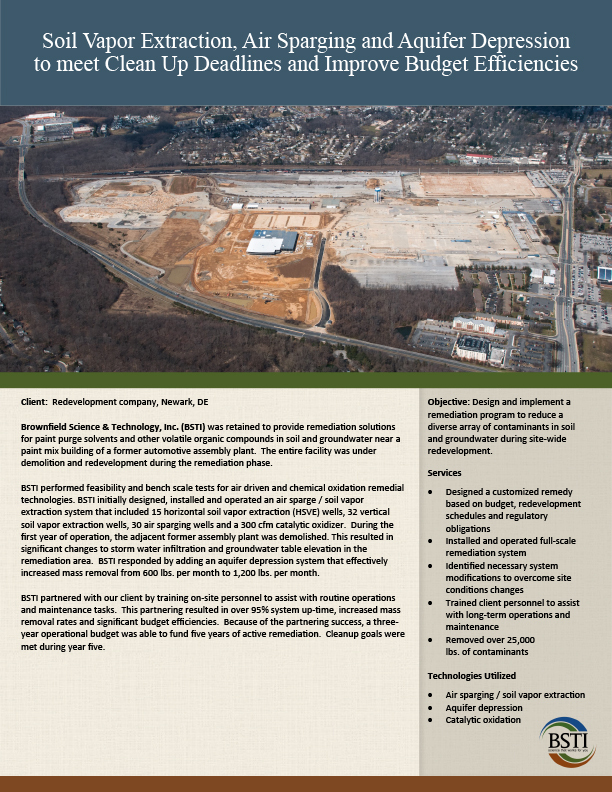 Brownfield Science & Technology, Inc. (BSTI) was retained to provide remediation solutions for paint purge solvents and other volatile organic compounds in soil and groundwater near a paint mix building of a former automotive assembly plant. The entire facility was under demolition and redevelopment during the remediation phase. BSTI performed feasibility and bench scale tests for air driven and chemical oxidation remedial technologies. BSTI initially designed, installed and operated an air sparge / soil vapor extraction system that included 15 horizontal soil vapor extraction (HSVE) wells, 32 vertical soil vapor extraction wells, 30 air sparging wells and a 300 cfm catalytic oxidizer. During the first year of operation, the adjacent former assembly plant was demolished. This resulted in significant changes to storm water infiltration and groundwater table elevation in the remediation area. BSTI responded by adding an aquifer depression system that effectively increased mass removal from 600 lbs. per month to 1,200 lbs. per month. BSTI partnered with our client by training on-site personnel to assist with routine operations and maintenance tasks. This partnering resulted in over 95% system up-time, increased mass removal rates and significant budget efficiencies. Because of the partnering success, a three-year operational budget was able to fund five years of active remediation. Cleanup goals were met during year five.